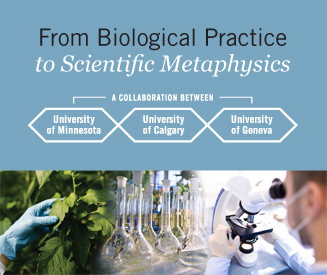 From Biological Practice to Scientific Metaphysics is a three-year initiative involving an international collaboration among the University of Calgary, University of Geneva, and University of Minnesota. Ken is a principal investigator with Alan Love, Marcel Weber, and Bill Wimsatt. Marc Ereshefsky (Calgary) and Marie Kaiser (Cologne) are co-investigators on the Calgary team of this project along with graduate students and two postdoctoral fellows. As we see it, scientific metaphysics is based on the idea that metaphysics — the study of what the world is most generally like — should be informed by the remarkable success of science. Proponents typically view the success of science in terms of the success of its best theories, the theories that many philosophers assume guide inquiry in mature sciences. Our project is based on the idea that instead of drawing metaphysical conclusions by interpreting the most basic theories associated with scientific practices, we should draw conclusions by analyzing the practices themselves. This opens metaphysical inquiry to areas of science including biological sciences that are not organized around efforts to articulate, develop, or extend the explanatory scope of a central theory.